The world's first cryptocurrency set another all-time high after exceeding the $18K threshold. 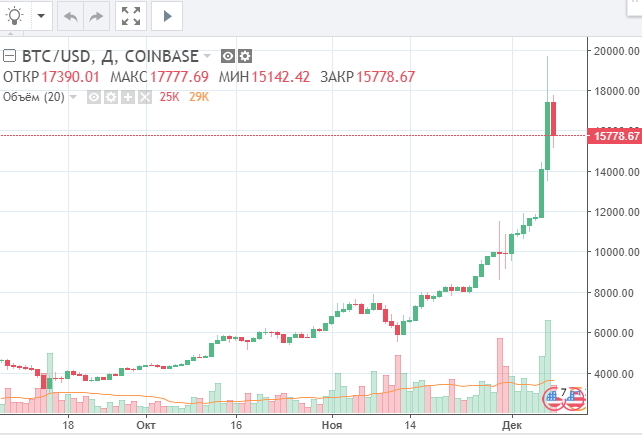 The other day, Bitcoin reached the highest point to date at 18328,9 USD/BTC, which was confirmed by Сoinmarketcap. At that point, the market cap exceeded 306 billion dollars. It’s interesting to note that the world’s first and most expensive digital currency managed to gain 25% in 24 hours. Traditionally, Asian markets have been the key drivers over the last couple of weeks. It’s interesting to note that Asian traders managed to push the BTC exchange rate all the way up to 21943 USD/BTC locally, FortFS reports. All in all, Thursday happened to be a unique day for Bitcoin. The thing is, Bitcoin managed to break above 5 psychological levels in a single trading day – $14K, $15K, $16K, $17K, and $18K respectively. By the end of Thursday, the cryptocurrency market in general managed to break the overall bearish bias. Apparently, this became possible only at the expense of Bitcoin since while Bitcoin was setting new all-time highs, most other digital currencies were going down. Bitcoin Cash and Monero were also on the list of the cryptocurrencies that finished the trading day in the green zone. At the end of the day, the overall cryptocurrency market cap was above 400 billion dollars. Actually, Thursday's Bitcoin buying craze was so intense that some online exchanges and other related services got their servers go offline from time to time. The reason behind this fever is clear. The thing is, the CBOE is about to launch BTC futures, Masterforex-V Academy reports. That’s why BTC exchanges have been loading up on Bitcoin to back those futures. It seems like Bitcoin is turning into a reserve currency for the market. According to the “10 shocking predictions” report released by international experts, Bitcoin is going to reach $60K in 2018. However, the expect Russia and China to interfere and eventually make Bitcoin drop down to $1K in 2019.